Other breeders advised Karen Riddle of Greenville, S.C., to euthanize a white German Shepherd puppy who was born without a right front paw. No way. Riddle realized the 9-week-old puppy would be the perfect companion for a child with a disability — and she was right. “I decided to call Shriners Hospital for Children,” Riddle told GreenvilleOnline. One of its patients happened to be 3-year-old Sapphyre Johnson, who had been born with a birth defect that left her without some toes and fingers. She had been at the hospital since she was 3 months old, undergoing multiple surgeries. 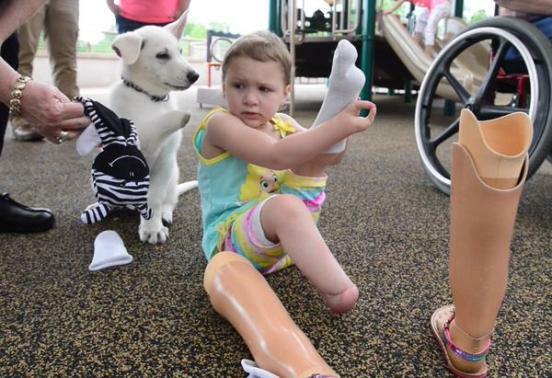 On Monday, Sapphyre was able to leave the hospital for her home in Tennessee with new prosthetic legs and the new puppy, who will be her therapy dog. The Johnson family named him Lt. Dan, after the character in “Forrest Gump” who loses his legs in the Vietnam War. Also wonderful: Shriners Hospital for Children, which made Sapphyre’s prosthetic legs, has promised to make a prosthetic paw for Lt. Dan when he’s fully grown.